Khalsa came back from behind twice against Coventry Sphinx and hung on desperately with ten-men for almost two hours to earn a highly unlikely replay in the FA Vase. This was a match spread over almost 140 minutes (thanks to endless stoppages) featuring four goals, one sending off, four goalkeepers and one last-minute goal disallowed. And this is before we talk about a linesman who looked like he was walking off part way through the first half and a last gasp tackle deep into extra time that would have made Bobby Moore proud. It was Sphinx who took the lead on ten minutes, Chris Sterling – full of bustling and running all afternoon – charged down the right flank and crossed to Leigh Phillips who, despite not making the greatest connection he will ever achieve, did enough to turn it home. Dan Westwood had chances on 18 and 23 minutes, a turn and shot was deflected wide first and then a freekick curled just wide. The game turned on its head on 25 minutes when Khalsa keeper Sam Arnold was sent off for bringing down Sterling. It meant Jay Holdcroft had to be sacrificed with substitute keeper Dale Reaney stepping in from the bench. Khalsa’s equaliser might have been a touch fortunate. Lee Chilton’s looped freekick beating the poorly positioned Richard Obimpeh from 40 yards out for his fourth of the season, bring Ian Rowe’s men back into the game. The ruling that the game would have extra time before a replay meant the odds were still stacked against the ten-man visitors. Coventry’s front-line, always snapping away and looking to spring the offside trap came in waves at Khalsa, sensing the need to kill off the game. Sterling failed twice within seven minutes of the restart to score one-on-ones, beating Reaney with both but also failing to hit the target. With Sphinx in the ascendency, Leon Miles and Dave Meese had to perform heroic blocks to keep the ball out as it spent long periods of time camped in the Khalsa box. Another turning point came in the 59thminutes, a Chilton free kick was tipped onto the bar by Obimpeh and from the resulting corner he was injured in a clash with Tes Robinson. Obimpeh had to leave the field and was replaced in goal by Michael Quirke. Now, normally this would be seen as a serious disadvantage for Sphinx with an outfield player taking the gloves. 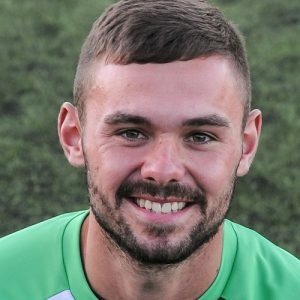 However, Quirke is a former Coventry City first team goalkeeper and Republic of Ireland international who is now enjoying playing outfield for Sphinx. Not a bad replacement. The home side continued to press, Jamie Tower toed wide in a good position after a break down the left by Callum Westwood. And Sphinx regained the lead on 68 minutes, a reasonably routine shot by O’Grady appearing to bobble over Reaney and the game should really have been killed off moments later when Towers took the ball past the keeper but blazed over when he really, really should have done more. With 15 minutes to go, things went from bad to worse for Khalsa when Reaney suffered a knee injury. Although he was able to continue (in the absence of any other options) he was barely able to stand, let alone perform routine keeping duties like kick, catch or come for crosses. Despite this, he pulled off good blocks from Ryan Harkin and Demi Smikle to keep Khalsa’s Vase campaign on life support. Unbelievably, Khalsa came back a second time, substitute Rico Taylor sliding a great ball to Mensah Kinch who tucked it away in style on 79 minutes to joyous celebrations. Two minutes later, Quirke produced a great stop to deny Westwood and at the other end Reaney somehow stopped an effort by Harkin as the match ticked into stoppage time. Six minutes into stoppage time, Chilton headed a goal bound effort by Louis Guest off the line and in the eight minute of time added on it looked like Sphinx had done it when a corner was headed home at the far post, only for it to be disallowed for going out of play. In the ninth minute of injury time, Quirke saved the day for Sphinx, saving a fizzing effort by Chilton with almost the last kick of the game. The thirty additional minutes were tense and scrappy, Sphinx trying to use the advantage of a full quota of players and Khalsa’s keeper having the mobility of Nelson’s Column. But in truth, it was Quirke who was the hero, producing truly great saves to deny Garfield Robinson and Westwood, the second of the two particularly impressive. With five minutes to play and, Smikle broke down the left but failed to find an unmarked Towers with the goal gapping. And two minutes later, the last notable action of an action-packed half was probably the best, Carlo Franco producing a jaw-dropping tackle to deny Smickle just as the striker was preparing to pull the trigger on what surely would have been a winner. Sporting Khalsa: Sam Arnold, Carlo Franco, Alex Melbourne (Garfield Robinson), Leon Miles, Tes Robinson (captain), Dave Meese, Mensah Kinch, Alex Perry (Rico Taylor), Dan Westwood, Jay Holdcroft (Dale Reaney), Lee Chilton. Subs not used: Shawn Boothe, Alex Woodhouse.